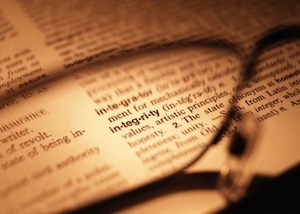 Integrity in business is a more complex topic than it might at first appear. Integrity could be summed as a list of “Don’ts” such as: don’t lie, don’t mislead, don’t conceal, don’t steal, don’t break professional ethics codes, and so on. Seen this way, integrity in business is simply about doing the right thing — as individuals and organizations. But there’s another perspective. Integrity is also integrally tied to business success. There are of course exceptions — many of which get highly publicized — but, the way to get ahead in business, as an individual and an organization, is through integrity. Having integrity leads to trust, which leads to lasting and profitable relationships. Organizations that have integrity get repeat business and favorable supplier contract terms. Individuals with integrity will find that the trust they earn opens up many opportunities. Conversely, without integrity, a person or company won’t be able to build the sustainable business relationships that are essential to long-term success. That’s why integrity isn’t just a moral issue, it’s also a practical one. Another reason that integrity in business isn’t as simple as “doing the right thing” is that even if everyone in an organization conducts themselves ethically, the organization can still lack integrity. If an organization’s business systems are unreliable, disorganized, and inefficient, then that organization doesn’t have integrity. These insufficient systems lead to unfulfilled promises, unmet expectations, poor service, and inadequate communication with business partners and employees. That’s a recipe for failure. Nowhere is the importance of integrity more evident than in contract management. Contracts are the foundation for business relationships and contracting with integrity gives that foundation the strength it needs to support the development of many mutually beneficial relationships. Contract management integrity begins with personal integrity by all people involved in the process. “After all, if a person cannot be trusted in the simplest matters of honesty then how can they possibly be trusted to uphold lengthy and complex business contracts?” Amy Rees Anderson pointedly asks in her article on the Forbes website, Success Will Come and Go, But Integrity is Forever. But contract management integrity also involves corporate-level planning and execution. This is where contract management software can provide essential support. With contract management software, milestone dates aren’t missed, reminders are sent, information is accurate, and legal compliance isn’t compromised. Those are just some of the many ways that contract management software can improve an organization’s trustworthiness. The efficiencies and accuracy of contract management software doesn’t just build trust in vendors and suppliers — they also build trust in employees, which can have a significant impact on morale and productivity. Like business partners, employees also respond more favorably when an organization demonstrates integrity. For example, a salesperson who can’t rely on their organization’s business processes enough to confidently interact with prospects is at a disadvantage. “I’ll check on what the contract says back at the office” isn’t good enough in today’s business environment where instant communication is expected. This same salesperson, with the support of contract management software, can immediately get the answer — building the lead’s trust in them self and the company. And as the salesperson’s own trust in the integrity of their contract management grows, it’s only natural that they become more enthusiastic and comfortable, as well as more attuned to nurturing the lead rather than worrying about tracking down information. Integrity is about more than just doing the right thing, it’s also about having the right business systems in place. Integrity in contract management is critical to building long-term, profitable relationships with partners and employees.